Authors: Jose Gilberto Biondo Jr. 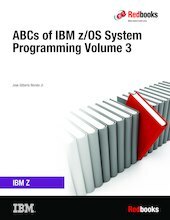 The ABCs of IBM z/OS® System Programming is a 13-volume collection that provides an introduction to the z/OS operating system and the hardware architecture. Whether you are a beginner or an experienced system programmer, the ABCs collection provides the information that you need to start your research into z/OS and related subjects. The ABCs collection serves as a powerful technical tool to help you become more familiar with z/OS in your current environment, or to help you evaluate platforms to consolidate your e-business applications. This edition is updated to z/OS Version 2 Release 3. Volume 10: Introduction to IBM z/Architecture®, the IBM Z platform, IBM Z connectivity, LPAR concepts, HCD, and DS Storage Solution.